E6 Energy Shot is a concentrated energy supplement made by 21st Century brands. E6 recently reformulated their shot to contain 235 mg of caffeine per bottle. 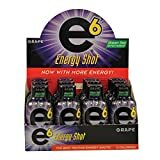 Previously it had 185 mg.
E6 Energy Shots are the 7th highest grossing energy shot (2013) in the USA and are found at gas stations, convenience stores, and Giant brand grocery stores as well as online. E6 has a pretty standard list of energy ingredients except for the inclusion of the amino acids; Tyrosine and Phenylalanine. See the complete list below. E6 Energy Shot isn't recommended for children or for those sensitive to caffeine. 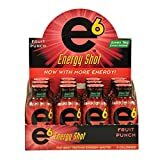 E6 Energy Shot Fruit Punch (12-2oz Bottle Pack) Sugar Free, Zero Calories - For Energy Boost, Better Focus - Best Tasting Energy Shot! E6 Energy Shot contains 117.50 mgs of caffeine per fluid ounce (397.31mg/100 ml).